Voids/Vides. A Retrospective of Empty Exhibitions.Centre Pompidou, Kunsthalle Bern, Centre Pompidou-Metz. White, N., 2009. Voids/Vides. A Retrospective of Empty Exhibitions.Centre Pompidou, Kunsthalle Bern, Centre Pompidou-Metz. In: Copeland, Mathieu, Hendricks, John, Philpot, Clive, Metzger, Gustav, Perret, Mai-Thu and Lippard, Lucy R., eds. Voids: a retrospective. Paris, France: JRP/Ringier. Artist Contribution. A Field Report from the Museum of the Void. 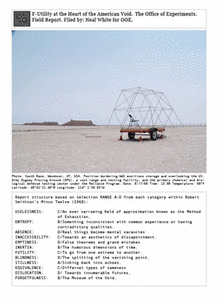 A page representing a field report from the Center for Land Use Interpretations research base in Wendover, Utah and based on Robert Smithson earlier text work Minus Twelve and his reference to this areas as The Museum of the Void. Catalog of an exhibition held at the Centre Pompidou, Paris, Feb. 25-Mar. 23, 2009, and the Kunsthalle Bern, Sept. 10-Oct. 11, 2009.